His Beatitude, Sophronius III was Patriarch of Constantinople from 1863 to 1866. He also served as Sophronius IV Patriarch of Alexandria from 1870 to 1899. Little is known of the early life of Patr. Sophronius other than his birth in 1798. 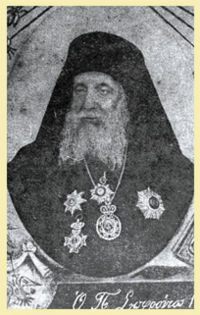 In 1866, he became involved in a dispute that the Archbishop of Sinai, Cyril Byzantius, had with his monks. To obtain help in settling the dispute Abp. Cyril approached, by letter, the Patriarch of Constantinople instead of the Patriarch of Jerusalem, who had traditionally enthroned the ruling bishop of Sinai. Patr. Sophronius supported Abp. Cyril against the monks, but the Patriarch of Jerusalem objected to this interference by Constantinople in the affairs at Mount Sinai, noting his, the Patriarch of Constantinople's, "anti-canonical interference and his foreign and unknown authority",  and summoned a synod. The synod supported the Patriarch of Jerusalem and deposed Abp. Cyril, and also Patr. Sophronius resigned from the see in Constantinople. After his election to the see of the Patriarch of Alexandria Sophronius was enthroned as Sophronius IV on June 11, 1870. He was a compromise candidate in a disputed election. In September 1872, Patr. Sophronius participated in the council in Constantinople that condemned as schismatic the action by the Bulgarian Exarchate (Bulgarian Orthodox Church) declaring itself autocephalous as recognized by the firman of Sultan Abdülaziz I of the Ottoman Empire. He served in Alexandria as until his death on September 3, 1899. This page was last edited on August 31, 2012, at 00:41.